Well July, you’ve been a bit of a rollercoaster month! I started the month full of optimism and excitement for the Allergy and Free From Show – but the day before I was due to go I was struck with what can only be described as the worst stomach bug I’ve ever encountered. 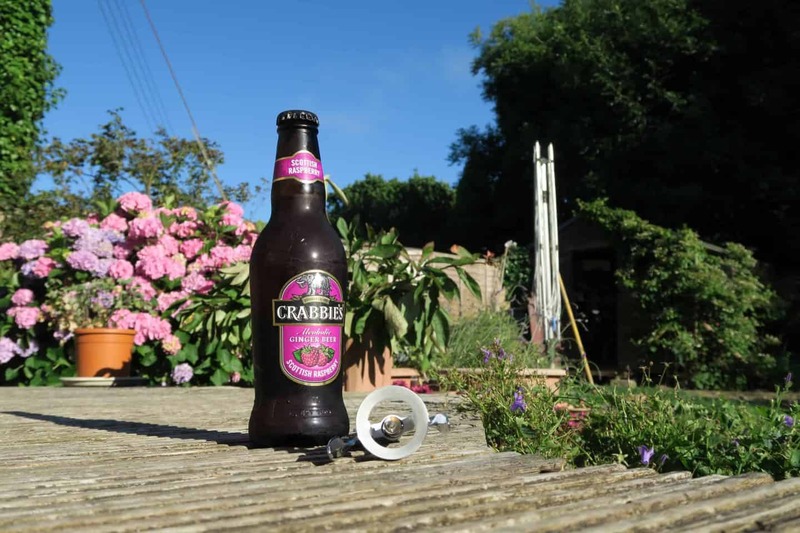 There is nothing that says summer like an ice-cold Crabbies on a hot summer’s evening – alcoholic ginger beer which is spicy and refreshing all at the same time. I first discovered it at a festival years ago and have been hooked ever since. Crabbies also have this new Scottish raspberry flavour, which in temperatures like this is quite simply heaven. You’ve got to try it! These AMAZING little bites are gluten free, dairy free, vegan… the list goes on! They were crunchy and chewy all at the same time and really cheered me up after being ill.
You couldn’t tell they were free of so many allergens and come in a handy box of five – though I find that a bit of an odd number for sharing. Perhaps that means you should eat them all yourself!? Hello, summer. This drink is seriously to die for. Ok, personally I think it would taste even better with some rum in it, but for a sweet drink packed full of sunshine this is IT. I don’t normally drink anything other than coffee at Costa but as I was still feeling peaky I decided to avoid caffeine. I hate to think how much sugar is in this (and it’s only a small) but it tasted divine. Not wheat, not a grain – these crunchy granola-type cereals from Australian company Loving Earth are unlike anything I’ve tried before. Sweet and tangy at the same time, they mix sweet coconut and bitter cacao with ‘activated’ buckwheat to create these lovely, crunchy clusters. They don’t go soggy in milk and are delicious with a little heated almond or cashew milk. These were another amazing product revealed at the Allergy and Free From Show which I couldn’t get to, and I’ve been waiting for them to appear on the supermarket shelves ever since. They are so much better than Bfree’s other wraps – you’d never know they have sweet potato in but I found them a lot softer and easier to wrap. Definitely worth a try. Ok, I really couldn’t do a post about my favourite things without mentioning these again! Gluten free Hobnobs are here! They are such a throwback to my pre-coeliac childhood and I really enjoyed breaking into a pack – you can read my full thoughts on them here. What have been your favourite gluten free goodies this month? Comment below and let me know what your favourite treats were! Previous Post Round up: What’s new in the free from aisles this month? The buckinis cereal sounds delicious! I haven’t seen it before but I will keep an eye out for it now.